Following an outburst on offense a week ago, it took a strong defensive performance and some fortune to help guide Bethlehem Steel to a crucial point on the road in Ottawa on Sunday. After taking care of business against Toronto FC II 4-0 at home, Steel traveled north to find a more formidable challenge in yet another Canadian opponent — Ottawa Fury. What ended as a mild 0-0 draw could have easily taken a different turn early on when fullback Olivier Mbaizo dove into a tackle that resulted in a penalty being awarded to the hosts. Fortunately for the young Cameroonian and his side Steeven Dos Santos bailed them out when he stepped up to take the ensuing kick and heard his shot ring the goalpost and echo throughout a hushed TD Bank Stadium. For Bethlehem, chances at goal were few and far between as their attack managed just one shot on target. With Ottawa playing for their playoff lives and Bethlehem already in control of their destiny, it appeared that they were content in playing to a 0-0 draw and did just that with a well executed game plan by coach Burke. With the draw, Bethlehem keep hold of sixth place in the USL’s Eastern Conference with just two matches remaining. 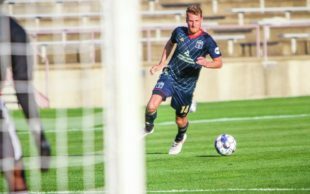 They’ll turn their attention to Indy Eleven next week before finishing the regular season at home against Tampa Bay. Another point means one more point added to what was already a team record 45 points. With the clean sheet, goalkeeper Jake McGuire broke a tie with John McCarthy for most shutouts in club history with 10. His five on the season matches his career best. Through Sunday’s draw, Bethlehem extend an impressive run of form on the road. Make it five games out of the last six games in which Steel have claimed points away from home–something they’ll have to do in the playoffs. Substitutes not used: David Monsalve, Onua Obasi, Sergio Manesio, Gabriel Balbinotti.